Dr. Claudiu Corbea joined Dr. Jeff Okamura’s team in July 2016 and has been the proud owner of the practice since August 2017. Born in Romania, he received his second dental degree with distinction from the University of Western Ontario and was on the Dean’s Honor List. Upon graduation, he was also awarded for his high level of academic achievement, interpersonal and clinical skills. 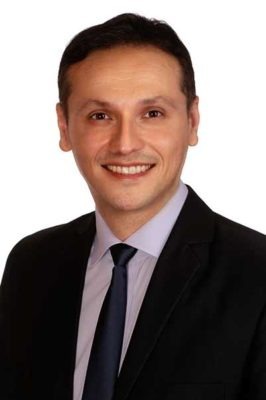 As an internationally trained dentist, he earned his first dental degree in 2004 from the University of Medicine and Pharmacy in Timisoara, Romania and decided to make Canada his new home in 2009. Throughout his training at both universities in Canada and Romania and via externships, research, and participation in emergency and pediatric dental clinics, Dr. Corbea has gained experience in all branches of dentistry taught by leaders in the industry. He routinely attends continuing education courses through his involvement with professional organizations. Dr. Corbea enjoys an active lifestyle, loves the incredible outdoors Alberta has to offer and prides himself on being able to relate to patients from all walks of life. Dr. Corbea is very outgoing and can make his patients feel comfortable and confident in his ability as their dental care provider.